Sonia Sheridan, 2005. Photo: Eric Legendre. 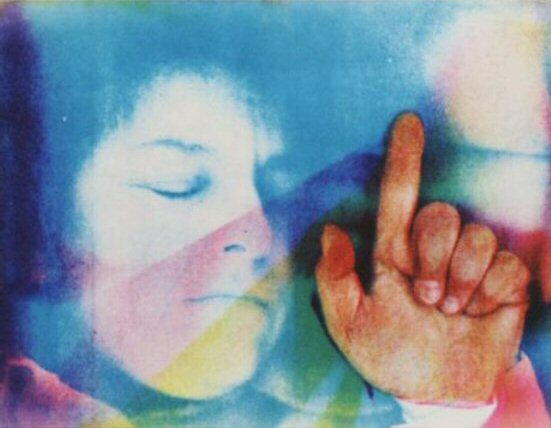 Sonia Landy Sheridan, The Magic Finger (Self Portrait with Pointing Finger), 1970, 3M Color-In-Color I on paper. Hood Museum of Art, Dartmouth College: Gift of the Artist; MIS.2004.84.565. Courtesy of Sonia Sheridan and the Hood Museum of Art. Process: Lumena / Sonia Sheridan, In Time (detail), 1985; Hardware: Times Arts Inc. PC computer, video camera; Software: Lumena by John Dunn (Time Arts); Ink-jet printer, 22"x58"; 1 slide. The Daniel Langlois Foundation for Art, Science, and Technology, Sonia Landy Sheridan fonds. Sonia Sheridan fonds. 1948-2004 (mostly 1965-1986). — 20 m of textual and other documents. The Sonia Landy Sheridan fonds was acquired by the Daniel Langlois Foundation in April 2005. The fonds exemplifies the groundbreaking role played by Sheridan in the use of industrial photocopiers as creative tools. It also reflects her contribution to the promotion of an interdisciplinary approach to the teaching of fine arts. In addition to documenting Sheridan's internships in various industrial sectors from as early as the mid-1960s, the fonds is a testament to the extraordinary reach of Sheridan's artistic legacy, principally in the United States, but also in South America, Europe and Asia. Moreover, the fonds traces the learning paths of students who followed the Generative Systems program, many of whom went on to distinguish themselves by exploring the creative possibilities of industrial photocopiers and other image-generating equipment. With its extensive collection of exhibition catalogues, periodicals and conference proceedings, the fonds provides valuable insight into the theoretical discourse that emerged in the mid-1980s on reprography technology and the intersection of photography and binary code. The fonds brings together documents recounting Sheridan's numerous research residencies spent in corporate environments between 1969 and 1972, as well as the technical records accumulated during these training periods. And while the fonds is comprised mainly of textual documents, it also includes a number of tests (printouts from photocopiers, digital files) and some artworks produced by Sheridan and her students, as well as videotapes from workshops presented by 3M engineers as part of the Generative Systems program. Most of these records are contained in the series Research and teaching activities. The fonds also includes a sizeable collection of solo and group exhibition catalogues and conference proceedings, which reveal the broad range of artistic practices placed under the rubric of reprography in the United States, South America and Europe. These records can for the most part be found in the series Books, exhibition catalogues, periodicals and manuscripts. And finally, the fonds includes correspondence and general documents relating to Sheridan's personal life. The fonds is comprised of seven series: Research and teaching activities (1960-2002, particularly 1960-1990); Publishing and editing activities; Events: exhibitions and conferences (1954-2004, particularly 1963-1992); Books, exhibition catalogues, periodicals and manuscripts (1964-2004, particularly 1964-1994); Background files (1968-2004, particularly 1968-1993); Artworks and printouts (1969-2002); General correspondence (1973-1994). Title proper.— Documents in English, German, Portuguese and French.— The fonds consists of originals and reproductions.— Certain restrictions with respect to consultation may apply.— Consultation, reproduction and publication of archival material are subject to the directives adopted by the CR+D with respect to the protection of privacy and intellectual property.— The production of finding aids is currently underway.